How to Choose The Metal ? Different metals come in different colors, looks, durability, strength and price. 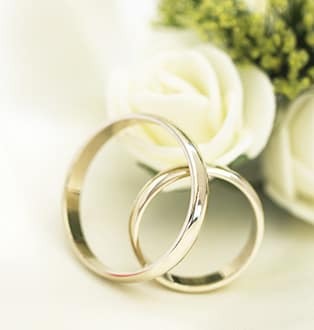 Gold: Gold has always been a classic and a timeless choice for a wedding band. The natural warm look and beautiful luster makes the gold wedding ring romantic and a desired metal. Gold is a measurable metal in carats and has 24 parts. Pure gold is measured as 24ct gold and it is too soft to produce a jewelry so it needs to be mixed with other metals to form the ring. 18 karat gold contains 75 % pure gold, 14 karat gold contains 58.5% pure gold and 9 karat gold contains 37.5% pure gold. The hardness and durability of gold varies depending on karat, so according to your preference, you can choose the karat that you desire. 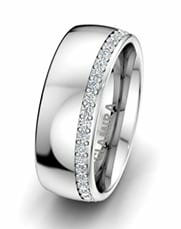 Palladium: As a member of the platinum family, palladium has a very nice natural silver- white colour tone.The white and lustrous metal provides a rich look. 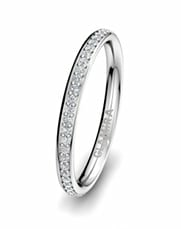 Its durability is high and this makes the palladium ring a lifetime piece. The biggest advantage of palladium is it’s light weight. So for the big designs, palladium is a great alternative. In addition to this, palladium is one of the rarest precious metals in the world so its uniqueness and longevity makes it very special. 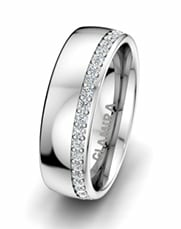 Platinum: The most prestigious metal for a wedding ring is definitely Platinum. Platinum has a very high durability so it feels heavier than other metals. It’s 30 times rarer than gold and 40% heavier than 14K gold.The density,purity and rarity makes the platinum ring extremely valuable and a protector therefore a platinum ring withstands for years. Moreover, its satin sheen and beautiful soft white hue has a natural, stunning look. Silver: The bright white gray of silver is like a moon’s reflection on the sea. The luminous of this beautiful metal matches perfectly with any gemstone. Silver is also very soft to be crafted so it’s alloyed with other metals to increase the durability. 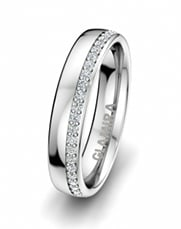 925 silver contains 92.5 % pure silver and this gives a beautiful radiance and a natural brilliance to the ring. The striking luster of silver is very attractive with its contemporary look. Color is an attribute which can be related to style. Important to draw attention, that if the person who will wear jewellery already has other pieces, colors could be matched to go well together. On another hand, different colors symbolize different impressions. Yellow Gold: The warm look of yellow gold welcomes you with a sunshine brightness. It is a classic yet fashionable and the bright effect stays true over time.The natural, beautifully sparkling yellow colour suits perfectly any style and is perfect for classic lovers because it has never gone out of style. The constant shiny appearance is for a lifetime, just like your marriage.The timeless quality will be on your finger forever. White Gold:The whiteness of white gold adds a contemporary and a unique look. Its durability is stronger and it is a great alternative if your budget is limited. White gold offers a cool and sophisticated gleam and its popularity continues for years.The reflective appearance of the surface provides an original and an elegant luxury.The futuristic, modern and gorgeous look shows your confidence. Rose Gold: The bright and stylish pink tone is very popular with its soft and elegant look. Its copper alloy gives the metal a beautiful pink shade and its trend is rising day by day. Rose gold represents love with its romantic appeal, provides a feminine look and the copper adds durability to the metal. The vintage style wedding bands look great because the enchanting beauty provides truly an amazing appeal for every ring style. How to Choose The Finish ? 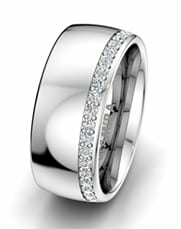 Polished: Polished finish rings are the most well-known classics and are very common in the jewelry world. It has a shiny and reflective effect. If you want an eye-catching piece, polished finish is an excellent option with its high reflection and mirror-like effect. The light reflection is quite high with the bright and shiny exterior of surface. Vertical Brushed (Matte): The timeless Vertical Brushed Matte finish provides a coated paintbrush touch and the elegant matte appearance is gaining popularity day by day. The recognizable appearance and sheen diffusion creates a great surface look.The brush stroke appearance covers the surface vertically along the band and provides a slightly dulled look but also has a distinct in the strokes. The refined look offers an elegant aura to the wedding ring. Horizontal Brushed (Matte): The subtle effect provides a tactile surface for horizontal brushed matte finishing. It is getting popular among young couples who like a unique look. The heavy texture offers a fully customised frosted effect.This finishing provides a new spin and a cool style for wedding bands. The horizontal brush stroke creates a beautiful contrast with highly polished inner side. Wire Brushed (Ice Matte): This finish is one of the newest trends with its beautiful wire brush finish. The difference between brushed and wire brushed is wire brushed finish has a deeper noticeable brush marks and its effects are heightened so it provides a smooth look. Sandblasted: Sandblast finish has a quite noticeable and a coarse finishing.When you touch the surface, you can feel the finishing effect easily. Sandblasted rings have a slight grainy feel and offers a textured feeling. How to Choose The Thickness ? The width and the thickness are connected to each other therefore when you make the ring width wider, you need to increase the thickness as well. 1.2 mm: This very delicate thickness is thin and very sensitive. If you like a humble but elegant look, this thickness is ideal for you. The finest designs look great with this slim thickness. In addition, if you like light rings and do not like the heavy feeling, this thickness is suitable for you. 1.4 mm: This thickness looks great for classic designs.If you have a big and a bright engagement ring, this thickness is ideal to obtain a great combination because it does not affect the sparkling look of your engagement ring moreover it supports the shining effect and adds extra shimmer. 1.6 mm: This thickness is very common and is generally preferred by couples because it is ideal for any wedding band style and looks great on the finger. It shows the design very well and also perfectly reflects the different finish effects. 1.8 mm: Slightly thicker when you compare with the other thicknesses and gives an elegant appearance to the stone for the woman’s wedding ring while providing a spark due to the increased thickness. If you like to feel the ring, with a clean look, this thickness is ideal for you.1.8mm thickness provides a great support and also the security and durability with a strong setting. 2.0 mm: If you have long fingers, this thickness creates a great look to show the beauty of all styles. The bold band provides a strong support. If you like showing off and like a delicate but more substantial feel, this thickness is very suitable for you. 2.0mm thickness is an excellent choice for optimum support and durability. How to Choose The Width ? If you have small and delicate hands with a small ring size, a thin wedding band would look great on your finger. 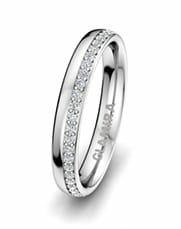 The simple and classic style also look great on a thin width wedding ring. 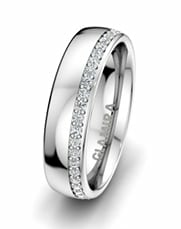 If you want to show the decoration of your wedding band and see the small details, in that case, the medium thick wedding bands are a great option. If you have long fingers with big ring size, the thick width rings are the best options for you.Thick wedding bands show simple or detailed styles quite beautifully because they have a bigger and wider surface for small decorations and also provides a delicate surface for simple and plain styles.You can select the same width with your engagement ring or you can create a contrast and combine two different widths. The slim one or a wider one? The choice is all yours according to your taste. How to Choose The Profile ? Comfort fit: This profile makes the inside of the band slightly domed with extra metal. It easily provides a squeeze over the large knuckle when wearing on your finger or taking it off. The rounded interior (where the ring touches the finger) helps the ring slide. If you have an active life and take your wedding band off very often , a comfort width wedding band must be your ideal choice. 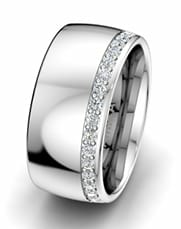 Comfort wedding bands become thicker from center of the band’s interior to its outer edges and covers less skin surface area. Flat Band Comfort Fit: This profile’s inner surface has a curved and a domed shape, but the outer surface has a flat shape.The convex curve helps wear the ring easily, so the ring perfectly slides when you wear or take it off. It provides an easy removing but at the same time it has a flat out surface so these two shapes gather in one design and create a unique and different look.